K. Imperial Fine Art is pleased to present its second solo show of the work of Peter Foucault. 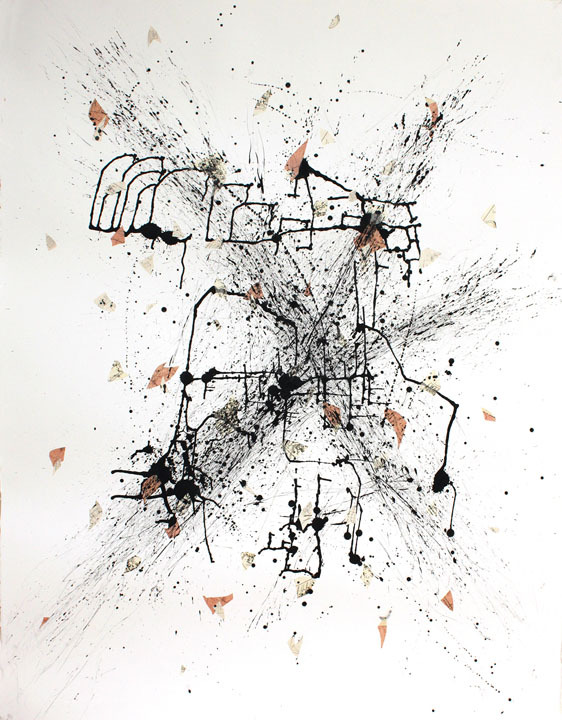 Foucault creates works on paper, videos, and installations that are fueled by his love of drawing and mark-making. He has created a series of Drawing-Projects, which utilize systems developed by the artist that produce complex abstract compositions. At the root of these projects is a constant tension between control and the loss of control. Viewer interactivity plays an integral role in his drawing installations – large-scale artworks in which participants influence the outcome of a drawing that is created by a small robot over the duration of an event or exhibition. His work is concept driven, and often utilizes objects that reference printmaking and multiplicities. Drawing In Dystopia internalizes the current political and environmental stresses, pressures, and disillusions and focuses them into a new body of work that is raw, dark, and chaotic. Some of the works play reference to tearing themselves apart by elemental forces while others hang onto a complex rigid structure that is also constantly in flux. The works also reference the formation of galaxies, the explosive death of stars, and matter being drawn into black holes to better put into perspective the current state of our earth. Ultimately, and as always, our current parameters will evolve, reconsider and re-shape. The paradigm we are in now is just the blink of an eye. Foucault has participated in numerous exhibitions nationwide, and his work has been included in shows at the Getty Museum and Getty Villa, Oakland Museum of California, Torrance Art Museum, Yerba Buena Center for the Arts, Smithsonian Institutes’ Freer and Sackler Gallery, The University of Salford (Manchester, England), and The Orange County Center for Contemporary Art. His interactive robotic drawing installations have been presented at The NASA Ames Research Center, Yerba Buena Center for the Arts, The Lab, Robert Berman E6 Gallery, the Seattle Next50 (Celebrating the 50th Anniversary of the Seattle Worlds Fair), and Zero1 San Jose. In addition to his own practice, Foucault is the Co-Founder of the Mobile Arts Platform (MAP), a Bay Area based art-making and curatorial team that creates interactive “pop-up” mobile exhibitions that directly engage the public. The MAP project was included in the American Association of Museums 2012 annual report’s “Trends Watch”. Drawing in Dystopia will be on view October 4 – 28, 2017 with a reception for the artist Thursday, October 5th 5:30 – 7:30pm. Copyright © 2017 K. Imperial Fine Art, All rights reserved.